You might not smile upon learning you need a dental crown to restore your oral health. However, as you learn more about some solid reasons to smile, you will see that crowns offer some wonderful benefits you might not have known about. Allow us to enlighten you with these advantages, so you feel fully informed about the restorative treatment you are about to receive – you might even find that you feel excited about this option to rescue your tooth. Crowns may last and last! As long as you keep up your end of the preventive care bargain with daily flossing and brushing and twice annual checkups and cleanings, you don’t need to worry. Crowns are known for their ability to withstand pressure and daily use, often lasting anywhere from 15 to 30 years or more. 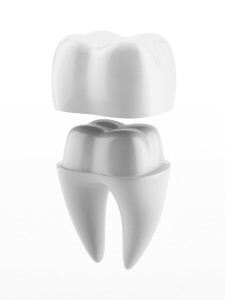 We offer beautiful, natural looking dental crowns at our practice. Whether you require extraordinary strength for load-bearing teeth or extremely lifelike esthetics for visible teeth, we will provide you with something beautiful and durable. We offer crowns crafted from porcelain, zirconia, or porcelain-fused-to-metal (PFM) depending on your needs. Placing a dental crown on your tooth includes a detailed process that ensures the fit is precise and extremely comfortable. We will take impressions of your smile and work with respected dental labs to provide you with a custom designed crown that blends and fits beautifully with your smile.